Seaway Fluid Power (SFP) provides convoluted Teflon Hose and smooth bore Teflon hose to support a wide variety of applications. Convoluted and smooth bore hose is in wide use in both high temperature and chemical resistant environments. As PTFE is both 3A and FDA compliant the food and pharmaceutical industry are frequent users of convoluted PTFE hose and smooth bore PTFE hose. 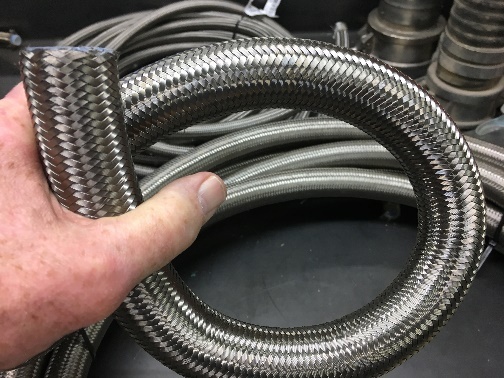 Other industries where PTFE Convoluted Hoses are used in semiconductor, automotive, chemical, food and beverage processing and petrochemical industries. The combination of steel braiding with convoluted tubing provides the strength required for high-pressure applications. Providing protection from wear due to friction. Convoluted tubing is chemically resistant to all commonly utilized solvents and hydrocarbons. Convoluted Teflon tubing offers flexibility not available from smooth bore Teflon tubing. By blocking electrical currents, protection is provided to monitoring instruments helping to ensure their accuracy. Reduces noise and provides reduced wear resulting in extended operating life. Provides resistance to mold or mildew. Convoluted tubing is capable of operating in temperature ranges up to 260°C/500°F. -Specified operating pressures specified based on a temperature of 20°C. -Convoluted hose in PTFE, resistant to fire, chemically inert. -Stainless steel AISI 304 braid.